Jabotinsky then turned his attention to Washington. Arriving in the United States in early 1940, the Revisionist leader launched a campaign to win U.S. support for the Jewish army idea. 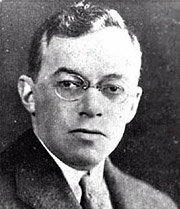 After Jabotinsky’s death later that year, the Jewish army campaign was spearheaded by two of his followers, Hillel Kook (using the pseudonym “Peter Bergson”) and Benzion Netanyahu. 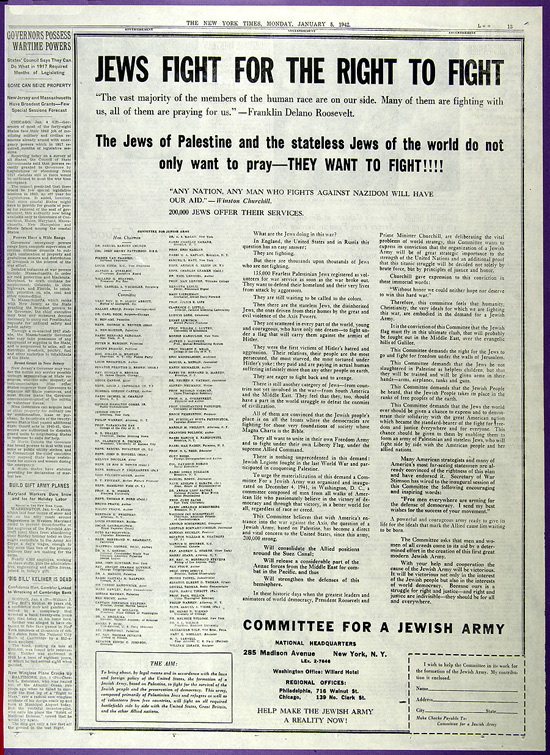 Their “Committee for a Jewish Army of Stateless and Palestinian Jews” sponsored full page newspaper advertisements, lobbied on Capitol Hill, and mobilized a coalition of supporters that included members of Congress from both parties, Hollywood celebrities, African-American leaders, and prominent artists, writers, and musicians. The committee was also active in Great Britain, where its chapter was led by Irgun emissary Jeremiah Halpern and strongly supported in parliament by Lord Straboli. The State Department feared that, as one official put it, the “agitation for the formation of a Jewish army” was having an “alarming effect” by arousing anti-American feeling in the Arab world. American Zionist efforts on behalf of a Jewish army and Jewish statehood were the main impetus for the proposal by the State Department and the British Foreign Office to issue a joint Anglo-American statement in 1943 banning all public of the Palestine issue until war’s end. Because it was established so late in the war, the Jewish Brigade fulfilled only a part of its supporters’ hopes. It saw only limited action on the battlefield and did not undertake the retaliatory raids its proponents hoped might deter Nazi masacres of Jewish civilians. However,, Brigade veterans did play an important role in the postwar smuggling of Holocaust survivors to Palestine, and later used their military experience to help fend off the Arab armies which invaded the newborn State of Israel in 1948. Wyman and Medoff, A Race Against Death, pp.20-28.